COLLEGE PARK, Ga -- Investigators in College Park and Henry County are comparing information from two separate crimes against women to see if the same suspect may be responsible for both. Both crimes happened in October. A 56-year-old College Park woman was taking a walk on Main Street when a car stopped beside her and the driver tried to get her in his car. Also in October, a 66-year-old Ellenwood woman was raped in her home. Police say the same man raped her in July. 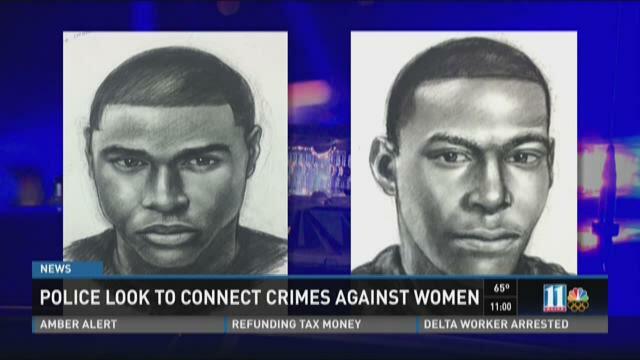 Both victims gave descriptions of the suspects to a sketch artist and the sketches are eerily similar. "And it seems that there's some similarities in terms of the composite drawings," said College Park Police Chief Keith Meadows. The victim of the attempted abduction in College Park told 11 Alive News the similarities are frightening. "It kind of gave me an eerie feeling," Sheryl Denton said. "Because if you probably put our two together that would probably be him exactly." Denton said she wasn't sure what was happening when the car pulled up to her as she crossed Howell Slade Circle. "When I stopped he just very calmly looked at me and he said 'Get in the car'", she said. She said she wasn't sure she heard him correctly and took a step closer. "Before I could do anything he told me again, 'I said, get in the car'", she said. Denton said she yelled 'No' and turned around and quickly walked to the Wayfield supermarket where she knew an off-duty police officer worked. She eventually gave police a good description of the suspect, but could only say he was driving a four-door, white sedan. The description she gave police is very similar to a description given to Henry County Police by a 66-year-old woman who says she was raped on two occasions by the same man. Henry County Police said she was raped in July and then again in October. Whether they are connected or not, Sheryl Denton says she has learned a lesson. "The message I would say for women is that it's just not safe for any woman to walk alone by herself. Whether it's day or night," she said. Denton said she won't go out for walks anymore, even though she needs to exercise for therapy. She now uses a stationary bicycle in her basement. Chief Meadows said investigators are also looking at a third case in Hapeville, another attempted abduction of a woman, for a possible connection. Anyone with information about the suspect is asked to call Crime Stoppers Atlanta at 404-577-TIPS (8477).